Kevin Hart, Chris Brown, Scott Disick and Blac Chyna have all recently been robbed of cash and jewellery. A new 'Bling Ring' gang could be patrolling Hollywood, targeting celebrities and robbing their homes. Kevin Hart, Chris Brown, Scott Disick and Blac Chyna have all recently been robbed of cash and jewellery, and cops are beginning to think the robberies are all linked. The infamous group of convicted teenagers stole $3million in jewelry, high-end clothes and art from LA stars in 2009. 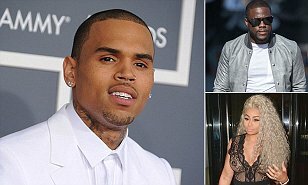 And since the reported burglaries of actor Kevin Hart, singer Chris Brown, socialite Scott Disick and model Blac Chyna, concerns are growing that a spin-off gang is in town.